Home / Cambridge Memorial Drive / How much do you love your London Plane Trees? How much do you love your London Plane Trees? Perhaps you might recognize them by their more common identity as Charles Eliot’s sycamore trees, as they have lined Memorial Drive in Cambridge since April of 1897. In any case, these trees and the streetscape at large were threatened by an insensitive road re-design in the early 1960s—a plan which sparked an outpouring of community resistance and demonstrations of dentritic attachment. 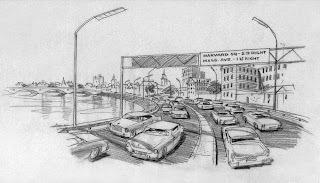 In 1962, the state legislature passed a bill allowing for significant changes to be made to the road design of Memorial Drive. The initiative from MDC outlined only the construction of three underpasses, which were planned for River Street, Western Avenue, and Boylston Street (JFK Street). 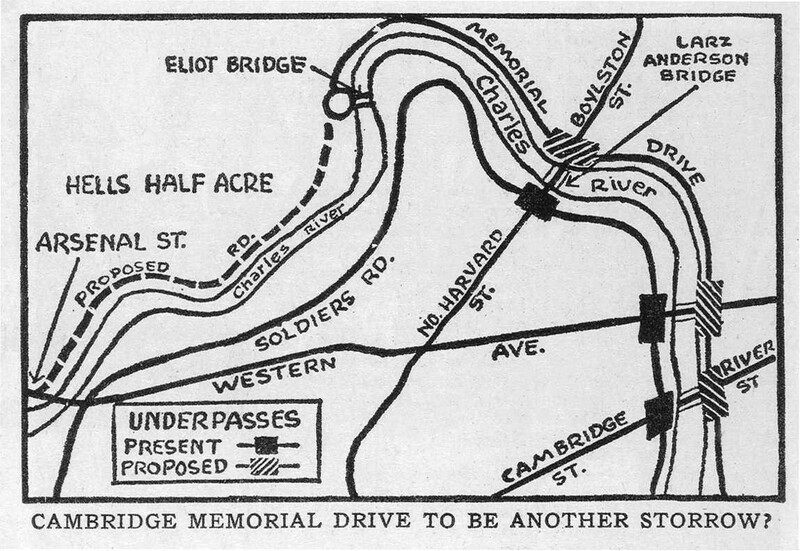 However, community groups such as Cambridge Civic Association and Organization Ten, as well as individual community members, feared that eventually Memorial Drive would be widened to an inhospitable eyesore of an expressway, with lanes soaring over and above the existing road, constructed expensively and necessitating the removal of Charles Eliot’s trees. 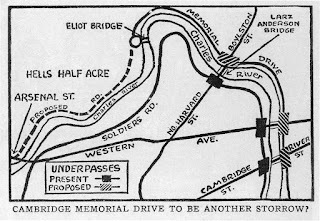 This prospect inspired the formation of a Citizens’ Emergency Committee to Save Memorial Drive, and the group became quite outspoken in 1964 once the actual construction plans for were revealed. Besides calling for six million dollars of taxpayer money, the project threatened usurping recreation space, weakening the urban planning, and either chopping or transplanting up to 130 trees, including 35 sycamores. 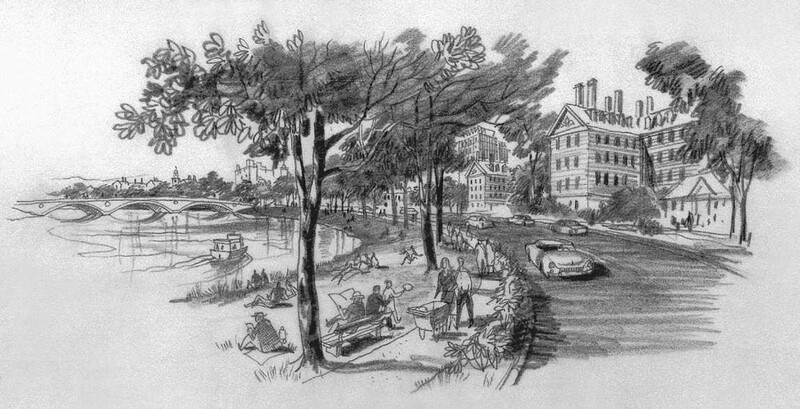 As an aside, the interest prompted investigation of the trees’ origin, and consensus was reached by experts from the Arnold Arboretum, the British Horticultural Society, and the Embassy of Thailand that Memorial Drive was in fact lined with Platanus x acerifolia—the London Plane tree—a hybrid of American and Eurasian Platanus trees. Among the more high-profile protestors, Edward Bernays, appropriately enough in his role as the father of Public Relations and co-founder of the Citizens’ Emergency Committee, successfully garnered support for the Citizens’ Committee’s cause from key political figures, prominent citizens, and the national media. A group of students were also spurred into action by the immediate threat to the trees posed by construction of a Memorial Drive underpass at Boylston Street. 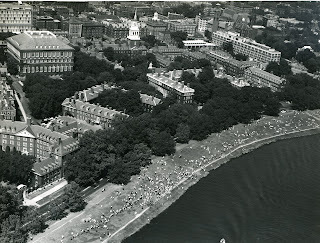 Close to a thousand Harvard and Radcliffe students formed a human roadblock, prompting The Harvard Crimson to report, “undergraduates joined the fun by staging a Save the Sycamore “protest” which held up Memorial Drive traffic for an hour and caused the MDC to bring on the canines” (Matthews, 05 May 1965). The Citizens’ Committee also formed a subgroup of members, affectionately called the Minutemen (a nod to the valor of the Concord Minutemen of 1775), to stand sentinel by the trees should MDC come by in the dawn hours to cut. Eventually, the plan was postponed, reduced, and then finally revoked by the end of 1965.